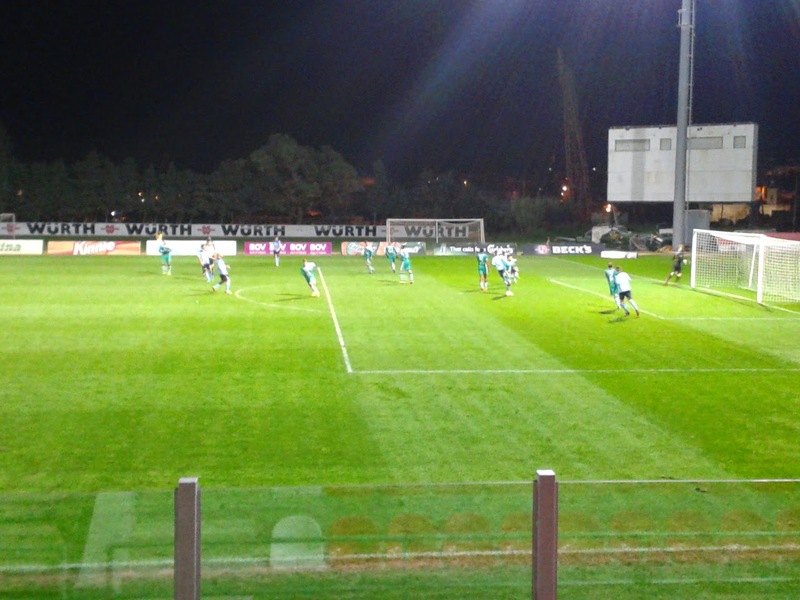 The final match of this series of articles hauled from the archives, dating from season 2013-14 in Malta's BOV Premier League, was the second in a double-header which took place at Hamrun's Victor Tedesco Stadium on 8/2/14, and featured the contest between bottom side Rabat Ajax and fourth-place Sliema Wanderers. With the excitement of the first match of the double-header, between Valletta and Balzan Youths, out of the way, the day's schedule at the Victor Tedesco Stadium in Hamrun was concluded with a match between Rabat Ajax and Sliema Wanderers, and neither team had very much to play for. This was perhaps reflected in the small crowd, just over 860 strong, that had gathered to view proceedings. Ajax had been enduring a miserable season before the match kicked off; they had won just the one match out of twenty, and drawn three, and were nine points adrift of eleventh-placed Qormi. Sliema Wanderers were in fourth place and already qualified for the championship section. It was all Sliema for the first ten minutes or so, and, with the exception of a few runs from Diego Carrillo Pendas, Rabat rarely ventured over the halfway line. Wanderers had the first decent chance after 10 minutes, though Admir Vladavic's effort from just inside the penalty-area went just wide. Stefano Biancardi's low header was palmed away by Rabat 'keeper Pavle Veilimirovic onto the crossbar and behind in the 18th minute, before Rabat finally had an effort on goal courtesy of Malcolm Licari, but his overhead-kick from 15 yards was tame and easily saved by Glenn Zammit. It was an untidy first half with few real chances to speak of, and most of those that were created came mostly from the Blues. Vladavic blasted over the bar from 20-plus yards out in the 25th minute, and Matias Muchardi's angled effort four minutes later went across goal and wide. Jacob Borg then went on a run down the left, and teased in a ball towards Ivan Woods, but the veteran was just beaten to it by Velimirovic. There was a bit of pinball action in the Rabat area with seven minutes of the first half left, but when the ball came to Alex Muscat 18 yards out, the Sliema defender blasted over the bar. Although Sliema had more of the possession in the first half, their general display was somewhat lacklustre and they paid the price in the 40th minute. A Sorin Virgil Oproiescu cross from the right was somehow missed by team-mate Licari, but not by Carrillo Pendas, who dummied two defenders and blasted the ball high into the net from 15 yards out to give Rabat a not altogether unmerited lead. The Magpies had shown much more purpose in the first half than had Sliema, and had dealt fairly easily with everything that their opponents had thrown at them. Woods had three attempts on goal before the end of the first half, but none of them were enough to bring the Blues level before the half-time whistle sounded. 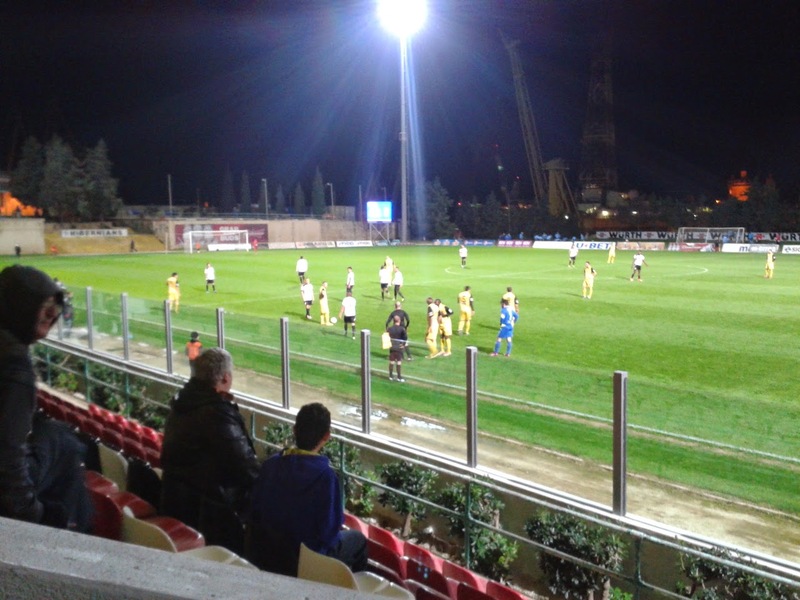 Sliema had grounds for complaint four minutes after half-time when Trevor Cilia was pulled back in the Magpies' penalty-area, but the referee let play continue. Sliema were becoming increasingly dangerous, forcing Rabat Ajax to rely on the counter-attack, and Matias Muchardi's long-range drive was put behind by Velimirovic who hurt himself in doing so, but was able to resume goalkeeping duties after a lengthy delay. The bottom side almost doubled their advantage on the hour, when Micallef danced his way from midfield through the Blues' defence, and his shot from 20 yards out beat Zammit but struck the outside of the post. A little period of pressure on Zammit's goal followed, with Micallef's shot from the edge of the area went high and wide. A couple of minutes later, Licari had the ball in the Sliema net, but referee Glenn Tonna ruled the goal out after adjudging that Zammit had been fouled; there was a slight nudge on the Sliema goalie, who then dropped the ball. You've seen them given..
Life slowly returned to Wanderers, and a cross from Cilia was headed wide by Stanley Ohawuchi. A little later, in the 70th minute, they equalised, much to the relief of those present with a blue heart. Ivan Woods cut in and passed to Muchardi from the left-hand side of the penalty-area, and he made no mistake from around 15 yards out, drilling a low shot with the outside of his right foot, first-time, past Velimirovic and into the bottom left-hand corner. Carrillo Pendas was excelling for Rabat, as was Woods for the Blues, and his effort in the 82nd minute, following a move which had Ohawuchi and substitute Axl Xuereb at its heart, brought out the best in Velimirovic, who flew high to the left to palm Woods' curling shot over the bar. Woods took the resulting corner, which went out to Ohawuchi on the left-hand side of the box. The Nigerian dummied Dylan Falzon before shooting through the legs of Shawn Gauci from 8 yards; it seemed to take an eternity for the ball to trundle across goal, through a confounded defence and past the wrongfooted Velimirovic before nudging the inside of the far post and crossing the line, but cross the line it did and Sliema were in front. Ohawuchi's goal was the culmination of a good twenty minutes from Wanderers, which was probably their best spell of the match, and Xuereb and Muscat both had chances to make the game safe during the last five minutes of normal time,but Xuereb's shot was blocked by a defender, whilst Muscat's angled effort went into Velimirovic's midriff. Five minutes of injury-time followed at referee Tristin Farugia Cann's discretion, and although the Magpies huffed and puffed, they could not really prise their way through a now clam-tight defence to gain a deserved point. Instead, all three points went to Sliema Wanderers, though no-one could doubt that they had earned them the hard way. AUTHOR'S NOTE: Many thanks to the MFA matchday staff on duty; some of the above information was cross-checked against the Maltafootball.com website. Due to rather inclement weather conditions across Malta at the beginning of February, two matches scheduled to take place in the Maltese BOV Premier League on 1/2/14 - Sliema Wanderers against Floriana, and Hibernians versus Qormi - were called off in the Maltese BOV Premier League on 1/2/14. The games were played on 3/2/14 at the Hibernians Ground in Coradino, and Hibernians and Qormi were the first teams to take the field. Goals, goals, goals were the order of the day in the clash between Hibernians and Qormi, taking part in front of a fairly sparse crowd at the Hibernians Ground, and the game's first corner went to Qormi after just 24 seconds, though this was cleared. The visitors, second from bottom, kept up their early pressure and were rewarded with a goal just a minute or so later, after Christian Terribile was put through by Leighton Grech; Terribile, in turn, put the ball through Hibs' goalkeeper Daniel Balzan's legs from 10 yards. There was a hint of offside about the goal, but there were no protests from the home team's players. 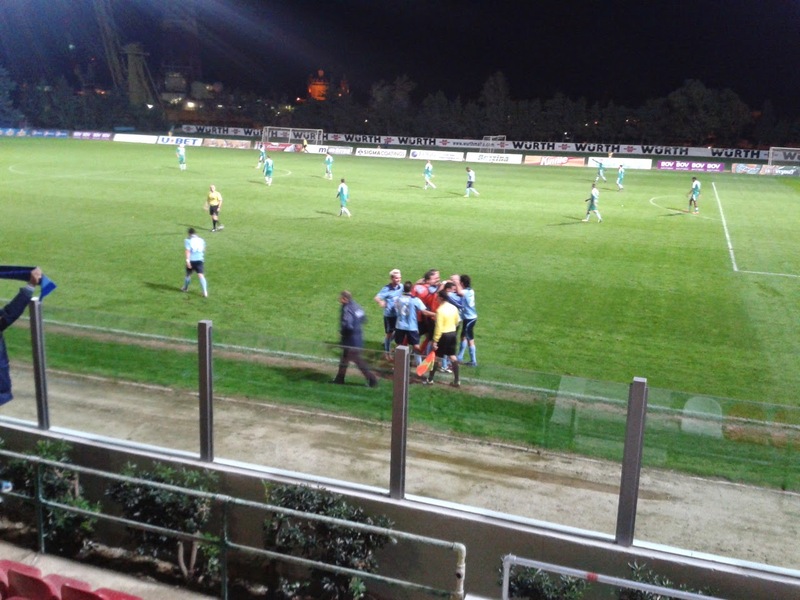 Lucas Cantoro was almost put clear in the third minute, but Balzan cleared the danger. Hibernians tried to fashion a quick reply, but their first attempt on goal in the 5th minute was an unsuccessful one. Jackson De Lima Siqueira's ball out to the left hand side found Matthew Bartolo, and the latter's curled effort was hard but a little wayward. Hibs cancelled out Qormi's early lead with an early enough goal of their own after 9 minutes. Obinna Obiefule barged his way into the penalty, jinked his was around Gorgio Gianola and toe-poked the ball to the left of Qormi 'keeper Mathew Farrugia. A minute later, the Lilywhites were in front after Qormi lost the ball in midfield and the ball came to Edison Luis Dos Santos on the right, who cut into the penalty-area and fired the ball into the bottom right-hand corner from 12 yards out. Bartolo almost made it three, getting on the end of a powerful cross in the twelfth minute, but the ball skewered wide of Farugia's goal. Obiefule did get the third three minutes further on after good work from De Lima Siqueira who had bombed through from midfield. A perfectly-weighted pass from the Hibs' number 7 found Obiefule on the left, and he neatly put the ball past Farrugia's left. Bartolo and Brandon Muscat both tried their luck in the 20th minute, Farrugia saving the former's effort well, only for the ball to rebound to Muscat who blazed his effort high and wide. Hibernians were very much on top at this juncture, and Qormi's cause was not help by a couple of suspect offside decisions being awarded against them. Still, they pressed on, and Grech's good ball to Cantoro on the right-hand side almost paid dividends, only for Balzan to foil Cantoro's low shot from 10 yards out. Three minutes later, in the 28th minute to be exact, Obiefule's run - past two defenders - and shot from the left was parried by Balzan; however, Dos Santos skied the rebound from four yards out, and in front of an open goal, too. Terribile headed over the bar on 37 minutes after a move of route one proportions involving goalkeeper Farrugia and Grech; Terribile appeared to have been pushed by Jonathan Pearson whilst contesting Grech's cross, but the referee was unmoved. Controversy was also to be found in the Qormi penalty-area; defender Gianola appeared to handle Obiefule's shot four minutes later, but the referee gave nothing on this occasion either. A minute later, yet another penalty appeal was waved away after Qormi's Alfred Effiong was seemingly pulled down in the box by two Hibs defenders. As the first half neared injury-time, Cantoro's free-kick from some 22 yards out cannoned off the crossbar, though Balzan actually got his fingertips to the ball, thereby producing a good save in the process. A scramble caused by the ensuing corner came to nothing, and the three minutes of injury-time ticked by without further incident. Qormi were first on the attack a minute into the second half, but Duncan Pisani's shot from the edge of the penalty-area was parried by Balzan, who succeeded in gathering the loose ball at the second attempt. Hibs' two-goal cushion became three in the 48th minute, with a delightful goal from De Lima Siqueira making it 4:1 for the hosts. A one-two with Bartolo saw De Lima Siqueira confronted with a Qormi defender, but this proved no problem for him; he simply flicked the ball over the defender and half-volleyed the ball into the net from eight yards out. De Lima Siqueira almost turned provider moments later, passing the ball to Obiefule, but his shot from around 12 yards out was saved by Farrugia. There was an off-the-ball incident in which Dos Santos appeared to have been elbowed by Cantoro, but the referee elected to keep the game moving; this led to a Qormi counter-attack at the end of which Grech shot just wide. Cantoro himself had a chance to peg the score back when he was left unmarked in the Hibs' box, but his header from a Grech cross went over Balzan's crossbar. The deficit was reduced to two goals courtesy of a goal in the 59th minute from Alfred Effiong. A patient build-up, emanating from inside the Qormi half and involving Simone Quintieri and Grech amongst others, saw a Pisani cross being chested down in a congested penalty-area by none other than Effiong, who beat Balzan with a scuffed effort from six yards out. Pisani himself himself had a chance to cut the difference to one goal, but shot wide from a corner. The game had provided plenty of goals and various talking points; the yellow card was much in evidence during the second half as well. Roderick Bajada had already been booked for Qormi during the first half; Terribile also found his way into the ref's notebook just before Qormi's second goal, and Hibs' Zoran Levnaic joined him after a foul on Effiong. Effiong was also booked for appearing to lash out in retaliation after a foul by Timothy Tabone Desira, which was followed by a head-to-head with De Lima Siqueira, who was also booked for his troubles. Qiuntieri then received a yellow card for a foul on Muscat. The two teams eventually got back to playing football, and Dos Santos put the ball over the bar after some human pinball in the Qormi penalty-area following a corner. After a show of speed from Dos Santos on the right in the 79th minute, he unleashed a cross-shot which only just evaded Obiefule, but was cleared for a corner by Effiong. Obiefule then put an effort just over a minute later after a one-two with substitute Jurgen Degabriele, and then fellow sub Jonathan Bezzina almost put the result beyond Qormi's reach with his first touch of the game on 85 minutes, but his shot to the right of Farrugia was palmed away by the keeper'and eventually cleared. In between times, Qormi had the ball in the Hibs' net, but offside had already been flagged. Jonathan Grech did eventually score a deserved third for the team in yellow in the 86th minute; he was on the end of a clever ball from Effiong, and stroked the ball past Balzan from 12 yards out, although there was a suspicion of offside about the goal, which stood despite appeals from the Hibernians defence. Effiong himself was almost in on goal two minutes later, but he was foiled by a good tackle from the last Hibs defender. Degabriele had a chance to wrap things up with a minute to go, but his shot after turning a Qormi defenderflew just over Farrugia's bar. No matter, the game was finally put to bed by De Lima Siqueira in the second minute of second-half injury-time. He was the intended target of a long through-ball, which instead reached Farrugia, who had come out to the edge of his area to beat the Hibs man to the ball. However, his attempted clearance was charged down by De Lima Siqueira, who simply ran on with the ball and tapped into the empty net before being immediately substituted by Zachary Scerri as the clock ran down. It was a pity that the game ended in such a manner for Farrugia, who, despite conceding five goals, had played well, as had Balzan in the Hibernians' goal. De Lima Siqueira, Obiefule and Dos Santos were the stars of the show for Hibernians, whilst Grech and Cantoro impressed for Qormi, with honourable mentions for Degabriele's cameo for the Lilywhites and Effiong for a determined performance for the losing team. THEN AND NOW: Hibernians went on to finish in third place in the regular championship season, nine points behind leaders Valletta. They were to finish the play-off season in the same position, and qualified for the first round of the 2014-15 Europa League as a result. 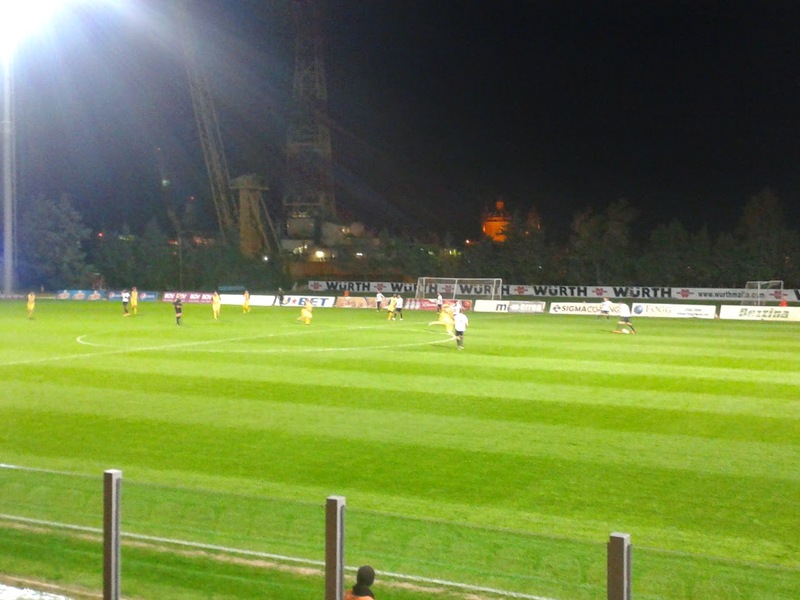 Their campaign was a short one, losing 9:2 on aggregate to Slovak side Spartak Trnava. Qormi ended the regular season in tenth place, ahead of Tarxien Rainbows on goal difference. They moved up a place to finish ninth at the end of the play-offs. So far this season, Hibs have astounded everybody involved in Maltese football, winning 15 of their first 16 league games so far this season, building up an imposing 15-point gap on nearest challengers Valletta and Birkirkara (who else?). Qormi are currently ninth, finding themselves a point in front of Tarxien Rainbows. Pietà Hotspurs follow in 11th place, with Zebbug Rangers currently occupying bottom spot with 9 points. AUTHOR'S NOTE: Many thanks to the MFA's matchday staff, and in particular to the security guard, who was also on duty the day before the the National Stadium in Ta'Qali and who doubles up as Hibs' groundsman! The Times of Malta proved a handy reference point. Sunday, 2/2/14 saw Malta's equivalent of a footballing Super Sunday with two attractive fixtures in the BOV Premier League making up the day's double-header at the National Stadium, Ta'Qali. Mosta Gunners put four goals past Naxxar Lions in the day's first match, a local derby, keeping a clean sheet in the process. Next up was the fixture many of Malta's football fans had been looking forward to: Valletta against Birkirkara. Almost 5900 fans turned up to watch the top-of-the-table clash between the current champions Birkirkara and Valetta, Malta's most popular teams, and they did not let their favourites down, creating a terrific athmosphere long before kick-off. Whilst the athmosphere was white-hot, the early stages of the match were anything but, though Birkirkara came close in the tenth minute when Jhonnattann's high ball was chested down by Shola Haruna, who rounded a Valletta defender but sidefooted wide with only Nukri Revishvili in the Valletta goal to beat. Valletta went on the offensive, and they drew first blood in the 12th minute, after Ryan Fenech, having been left unmolested by the Birkirkara defence to come forward with the ball, struck suddenly from 20 yards out, and his shot eluded Justin Haber, going low to the Malta international's left. An intricate move almost brought Birkirkara level on 17 minutes, when Gareth Sciberra's pass found Ryan Scicluna free in the Valletta box, but his shot from the near side was saved by Revishvili and went behind for a corner. A stalemate of sorts ensued for the next quarter of an hour, but it was almost broken by Valletta's Jonathan Caruana after a cross from Abdelkarim Nafti in the 31st minute, but his header from close range went over the bar. At the other end, Birkirkara's Serbian defender Nikola Vukanac put a header wide from a Paul Fenech free-kick three minutes later. Fenech himself had a chance to level things up with five minutes to go to half-time, courtesy of Caruana losing the ball to Haruna and then more or less passing it to Fenech, but the Birkirkara forward lofted his shot just over the bar. Valletta's captain, Ryan Fenech, received a pass from Hamza Barry as the first half moved in to the second minute of injury-time and tried his luck from just over 20 yards out with a low shot, which went to the left of Haber and wide. Birkirkara, who had won each of their last 13 league games, were clearly in the mood to increase their winning streak to 14 matches, and began the second half with purpose. A cross from Haruna on the left-hand side was headed just over the bar by Jhonnattan in the 47th minute, and, six minutes later, Haruna himself saw his rasping strike well saved by Revishvili after some good work from Rowen Muscat put him in a shooting position. Revishvili's save resulted in a corner for the Stripes, and Zach Muscat connected with Jhonnatan's corner only to send the ball wide. However, the referee noticed that Alejandro Mendoza had been hauled back by Caruana in the penalty-area and pointed to the penalty spot. Haruna took the kick, though it was hardly the perfect penalty. The Nigerian's spot-kick was weak to say the least, but was no doubt relieved to see Revishvili dive to the right as the ball went to his left. 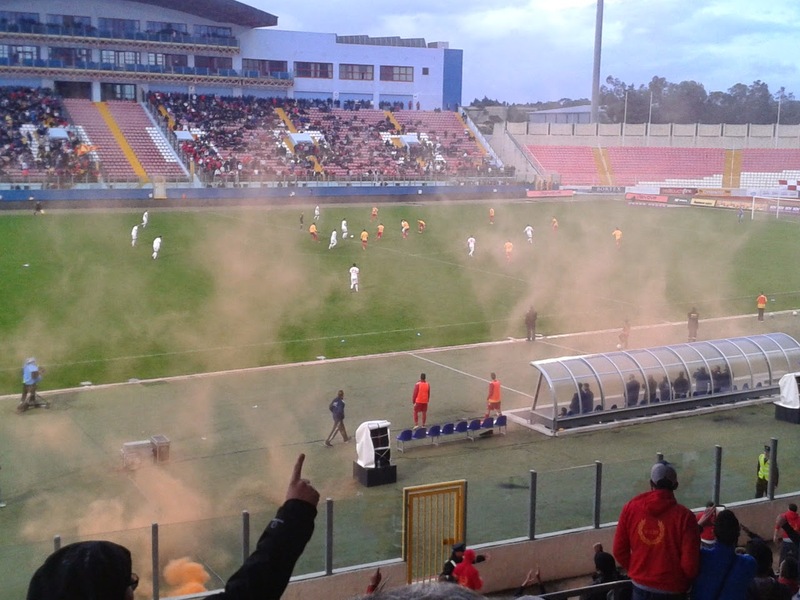 Birkirkara were level and deservedly so. They then moved up a gear, sensing that victory was theirs for the taking, and they were all over the pitch like a little swarm of red and yellow ants. Valletta, on the other hand, were struggling somewhat and could hardly string two passes together. Paul Fenech was denied by a last-ditch tackle moments before Rowen Muscat tried his luck from the left, but his shot was fisted away by Rekashvili. Haruna cut in past a defender on the edge of the Valletta area and let fly, only to see his shot fly just over the bar. Birkirkara were deserving of a lead, and Haruna of his goal as he had been superb for the Stripes, but it was Valletta who got their noses in front in the 63rd minute thanks to a goal to savour. Edmund Agius' free-kick was headed out as far as Hamza Barry, who thrashed the ball from 20 yards past Justin Haber's despairing dive into the top left-hand corner of the Birkirkara net. The Citizens' supporters, who were in the majority, were now in ecstasy after suffering in silence for most of the second half up to that point. Shaun Bajada almost extended Valletta's lead two minutes later, but his shot, which came at the end of a run from midfield, went just wide of Haber's goal. As the roof over the West Stand began to leak, Barry did exactly the same for the Citizens in the 71st minute. Paul Fenech went close for Birkirkara in the 76th minute, when, following yet another foraging run from midfield, his shot from more than 20 yards went just over Rekashvili's bar. Fenech's effort was followed by a couple of half-chances for both teams, none of which were taken. His namesake Ryan also had a shot on goal for Valletta as the game approached its conclusion, but his shot was wayward. Another shot from Paul Fenech was blocked as the 90-minute mark approached, and another effort shortly afterward flew over the Valletta bar. Birkirkara intensified their pressure on the Valletta goal during injury-time, but created nothing of note in that time. It really was a case of too little, too late as the Stripes' impressive 14-match winning streak in league competition was ended by a victory for the team in white, which was celebrated in rapturous fashion by the City fans, and which closed the gap between the two teams to three points. AUTHOR'S NOTE: Due to the lack of provision of team-sheets (they had apparently already been given out to the local press corps), some of the above information was taken from the Times of Malta and from Wikipedia. The 2014-15 Campionato Vaticano got under way on 13/10/14 with a match between Associazione SS Pietro e Paolo and reigning champions San Pietro, which San Pietro won in resounding fashion, running out 6:1 winners. Next up were Fortitudo/Pantheon - a merger of two of the teams which took part in last year's league and cup tournaments - against Dirtel, and the latter took the spoils with a 3:1 victory. Guardia, who finished bottom last season, and last year's runners-up Santos came up against each other in the Tuesday night match, and Santos won this one by the odd goal in five. Seven teams are taking part in this season's championship, with Musei Vaticani being the only side that weren't in action in the first round of fixtures. A total of fourteen rounds of regular league football will be played, with the now-familiar two-leg semi-finals to follow on 16/3/15 and 23/3/15, and the championship final bringing an end to the league season. The final is scheduled to take place, as will all matches during the season, at the Associazione Sportivo La Salle complex in Rome on 30/3/15. All results from the league competition shall be published throughout the season on the Pat's Football Blog page on Facebook as and when they are made available. For now, though, please find below the fixture-list for the 2014-15 Vatican City league championship. AUTHOR'S NOTE: Many thanks, as always, to the ACDV (Attività Calcistica Dipendenti Vaticani) and Aurelio for kindly providing the above information. Nuuk side B-67 won the 2014 Greenlandic national championship at the final tournament played in their home town between 4-9/8/14, which was hosted by fellow Nuuk side NÛK, by defeating FC Malamuk 1:0 in the final on 9/8/14. In direct contrast to last year's tournament, all of the drama took place on the pitch,and B-67 were once again the dominant team throughout, though they almost came a cropper against Illulissat side Nagdlúnguak 48 in their final group game, drawing 1:1; that, though was as close as they came to suffering defeat during the entire championship season. Perhaps the biggest surprise was the performance of the third side representing the capital in this year's competition, debutants IT-79, who finished third and picked up a couple of notable scalps along the way. They defeated Nagdlúnguak 48 3:2 in a game which many expected would be a walkover for the men from Ililissat, and, although defeated 1:0 in the semi-final stage by FC Malamuk, put up a good show, and proceeded to spring the biggest surprise in the whole tournament by defeating G-44 in the third-place match. As ever, G-44 were among the pre-tournament favourites, but were defeated in the other semi-final by B-67, in a game which many would have thought worthy of the final itself. Before the third-place play-off and the final took place, the minor placings were decided, and Eqaluk 54 defeated Nagtoralik by 3 goals to 2 in the wooden-spoon decider. Tasiusaq-based Eqaluk 54 had shipped 15 goals in their three group games, finishing pointless, though they were placed in what was arguably the more difficult group of the two. Nagtoralik, who hail from Paamiut, only qualified because TM-62, from the eastern town of Kulusuk, who qualified for the final stages by winning their regional championship, were unable to take part due to financial considerations. Nagtoralik finished bottom of their group with one point, which came courtesy of a draw with NÛK. NÛK were up against Nagdlúnguak 48 in the fifth-place play-off, and, particularly for the latter, the competition was something of a disappointment. Disqualified from last year's competition for fielding an ineligible player during the regional round, Nagdlúnguak had something of a point to prove. However, the wheels came off the bus during their first game against IT-79 when they lost 3:3, though they recovered their poise to beat Eqaluk 54 5:0. They needed to defeat B-67 by something like 7:0 to stand any chance of reaching the final, but could only manage a 1:1 draw. NÛK had performed with credit in Group 2, drawing their first two games, but lost their final game 2:0 against eventual group winners FC Malamuk. Most of the matches in Group 2 were fairly close affairs, with few goals being scored. NÛK scored only twice in their three matches, and this run continued against their visitors, with Nagdlúnguak running out 1:0 winners. Surprise team IT-79 had to face Qeqertarsuaq's finest, G-44, in the third-place play-off, which was, in G-44's case at least, something of a disappointment in itself. G-44, you may remember, were runners-up in last year's competition and were favourites to finish first in Group 2. They finished unbeaten in the group, but were undone by drawing their first two matches, and finished two points adrift of FC Malamuk despite defeating them 2:0 in the final group match. IT-79 both surprised and impressed during their maiden appearance at the national championship stage; the club, which was only founded in 1979 by a group of students who had returned to Nuuk after studying in Denmark, only began entering the regional stages a few years ago. and since then normally finished third or fourth in the regional competition. NÛK's designation as hosts opened the door somewhat for IT-79 to qualify for the national championships, and they did so by winning two of their three qualifying matches. IT-79 lost 6:0 to B-67 during the qualifying tournament, and lost 3:0 against them in their Group 1 game. They had shocked Naglúnguak 48 in their first group match, and defeated Equaluk 54 4:1 to qualify for the semi-finals, where they lost 1:0 to FC Malamuk. G-44, who had lost 2:1 to B-67 in their semi-final, were strong favourites to take third place; however, the underdogs from the capital had other ideas, and, despite being under the cosh for most of the game, did not wilt under the pressure and came away with a 2:1 win. IT-79 more than deserved their place in the sun, and team manager Allan Geisler admitted that he was proud of his team for their efforts, singling out midfielder Kaassannguaq Zeeb for special praise. The final between B-67 and FC Malamuk was perhaps not one which everyone had expected, but the end result was. B-67 dominated the final against a plucky FC Malamuk, and deserved their 1:0 win. It was B-67's tenth national title, equalling Nagdlúnguak 48's record, and both teams' performance in reaching the final was rewarded with both teams having three representatives in the tournament's Best XI. An extra source of consolation for FC Malamuk came in the shape of defender Niels Svane being voted Player of the Tournament. For B-67, it was a case of their cementing their place at the top of the pile in Greenland and, unlike last year, with the minimum of fuss and controversy. AUTHOR'S NOTE: Much of the above information was gleaned from KNR and Sermitsiaq; thanks, too, to Allan Geisler, IT-79's team manager. A couple of the results were taken from the RSSSF website. For those wishing to watch the games on the KNR archive, it would appear, sadly, that the links have been removed from their website.